What became codified as "the surge," having evaded Congress, appears to have morphed into a large-scale insurgent force within our own military. Thats the biggest load of horse... that I have ever heard or read. Its the General's PR machine working overtime to secure his next cushy job before things go to the lowest level of Hell in Iraq. What Eisenhower feared has happened. The USA is completely militarist, our economy dependent upon the military industry... we must have a war going perpetually or the house of cards will collapse. 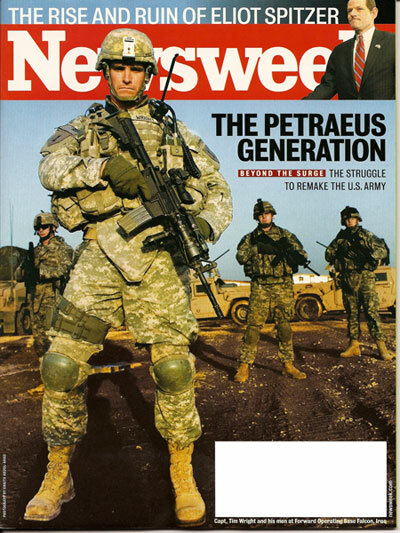 Assuming that the resources portrayed in the Petraeus Generation photo are deployed in response an immediate problem it behooves us to stand back and ask the obvious question: What is the problem for which this, Petraeus Generation, is the solution? Limited to just the photo it looks like a tactical military unit has been given a tactical military objective, perhaps holding an intersection against enemy military occupation. Something like the goal of holding the bridge at the end of the movie Saving Private Ryan. They are armed and ready and I wouldn't want to have to walk through them. It is real hard, impossible in fact, to infer from the picture that these men and Gen Petraeus are charged with restoring civil order — water, sanitation, the power grid, etc, along with the civic institutions that derive from self-government — in an occupied nation. The tools at these men's disposal are not appropriate for that end. Either the Petraeus Generation is not a very good answer or I really don't understand the question. Oh no. That's not what it looked like at all to me. My instantaneous reaction to the guy up front was confusion. He doesn't look stable to me at all. Where is his center of gravity? He doesn't appear to be resting any weight on his right leg and the knee-pads make his legs look bent and I couldn't figure out how he is standing upright at all. They look like an array of those green plastic army men, ready to topple at any moment. UN Secretary General stated that the use of force without Council endorsement would "not be in conformity with the Charter" and many legal experts now describe the US-UK attack as an act of aggression, violating international law. Experts also point to illegalities in the US conduct of the war and violations of the Geneva Conventions by the US-UK of their responsibilities as an occupying power. 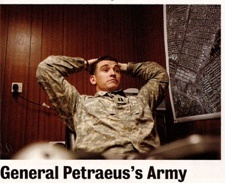 The Petraeus Generation is simply the latest batch of unlawful combatants. He who conforms best eventually surges to become US Army Chief of Staff. My money is on the Peacock General. The expression on the face of the soldier (who reminds me a little of a young Charlton Heston) mimics that on Eliot Spitzer, up in the corner. Both grim, glum, determined - and SOL. ...legionaries with vision-seeking phylacteries bound to their foreheads, carrying the rods of imperial power. Looking for truth in darkness, and ready to enforce it as needed.